Why Do Wild Animals Appear In Your Garage So Much? Animals often seek shelter in residential places like garages because they are looking for relief from the cold or storms. Some could be searching for food or wanting to have a safe nesting area to raise their young. No matter what the reason, these uninvited guests cause a lot of damage and need to be removed. Animal damage to homes in Haslet and Fort Worth, TX can be prevented with proper garage installation in repair by Custom Garage Works. Call us at 214-494-9068 to learn more. 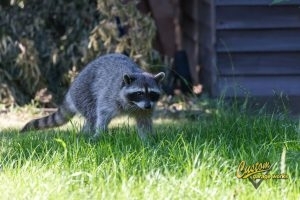 If you suspect you have a wild animal that is intruding onto your property, whether that is nightly visits into your yard, or making a nest in your shed or garage, you need to be able to identify it to know how to remove it safely. Location, sounds, what parts of your house or yard are damaged, and animal droppings are all common signs that can help you locate and then identify what type of animal it is. You can then either try to remove the intruder yourself depending on how small it is or seek professional help from a wildlife removal company. Bat: enters your home through the roof, chimney, or attic. You will hear a lot of activity in your roof at night which can result in animal damage to your roof. Raccoon: the most likely animal to enter your garage would be a raccoon. This is because they are the animals that love to raid trash the most, and trash bins are often right next to garages for trash pickup. Other ways they can get into your home is by climbing down the chimney or entering from underneath your home through a crawl space in the foundation. Chipmunk or squirrel: A chipmunk damages plants and blooming flowers as it burrows. 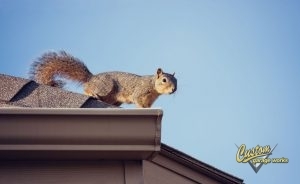 A squirrel will likely be found in your attic as it enters the home from tall trees. Look for nests in your soffit and fascia and chewed-through roofing as entry points. Coyote or fox: these predators can adapt to any area that have food and water and are known to prey on livestock and household pets, especially small dogs. Foxes burrow in dens, and are known to create these caves under house decks and sheds. Crow or pigeon: birds commonly get trapped in buildings accidentally as they fly through an open window or door. Some intentionally make nests in these places as they deem them safe, so be sure to check your garage or shed as these are secure, quiet, and warm places for the birds to keep their young. Mouse or rat: These rodents love houses and garages, especially in the wintertime, as they are insulated and warm. If your garage happens to have a heated garage floor coating application, this could attract the mice even more in colder temperatures as they seek out heat. Custom Garage Works can re-apply these garage coatings if your garage floor experiences animal damage in Haslet and Fort Worth, TX. Call us at 214-494-9068 today. Opossum: Just like raccoons, these animals love to eat out of garbage, so they are often spotted in neighborhoods. You will often see them in your driveway when it is trash night, so they will make their way up the concrete path to the garage and invade it. Porcupine: these animals need food that have salt residue in them, so they often eat tree bark. They will flock to yards and damage your trees and have been known to damage your tools if they get into your garage or tool shed as well, as the tools taste salty to them! Rabbit: rabbits love to eat gardens, so they will often eat your lawns. It usually doesn’t bug residents too much until the rabbits start to breed, and then the females look for shelter to give birth and raise the young. This is when they seek out sheds and garages and cause tons of animal damage like chewing and droppings galore. Skunk: skunks also burrow, but they dig looking for grub. Known as the scaredy cat animal, they are jumpy and will spray at anything, which is why they often hide out in sheds, garages, and under porches and decks. Snake: while you will most likely experience just the average harmless garden snake, there are possibilities where other more dangerous breeds of this reptile can enter your yard and be a danger to your family and pets. You can call for wildlife control management to come remove it. If Raccoons Have Caused Animal Damage in Your Garage, We Can Repair It! If you are wanting to know ways to prevent animal damage to your home, there are quite a few deterrent methods you can try. Clean out your garage and make sure there is no leaks, as moisture attracts animals. Look for any holes, cracks, nests, or openings where the pests could be entering or habitating. If you spot any signs of these, make note of where they are for repair. Then you can spray pesticides or use other animal damage control techniques to get rid of the creatures. Professional animal damage management companies in the Haslet and Fort Worth, TX are also available if preferred. For garage repair, you can call Custom Garage Works at 214-494-9068. Since raccoons are some of the most common wild animals to enter your garage, here is a brief FAQ on how to remove them. How do I get rid of raccoons in my yard, and will raccoons leave on their own? Raccoons don’t like loud, bright, ot stinky places. By leaving a bright light on all night, placing ammonia-soaked clothes out to permeate the air, and using raccoon removal techniques like their food and water sources by bringing your trash cans and outdoor pet food inside, they will often leave on their own. How do you keep raccoons away? Adding fencing, removing their food source sources like trash bins, and tending to pets will often keep raccoons away. Is animal damage covered by homeowners insurance? Surprisingly, yes, as long as the animal that caused damage to your home was not a rodent. Rodent-like creatures like possums, skunks, birds, and bats do not fall under this category and therefore should be covered by your insurance. Only mice and rats are not. Just be aware that your insurance will most likely only literally cover your home. If a wild animal damages anything not attached to it on your property like a fence, detached garage, or shed, then it is not covered. Posted in Uncategorized on January 10, 2019 at 8:52 pm by Custom Garage Works.